Victory deck commemorating the Liberation war by Friedrich Gotthelf Baumgärtner, Leipzig, 1815. Copper engraved, hand coloured by stencil, 36 cards. Baumgärtner was the owner of the Industrie Comptoir in Leipzig. 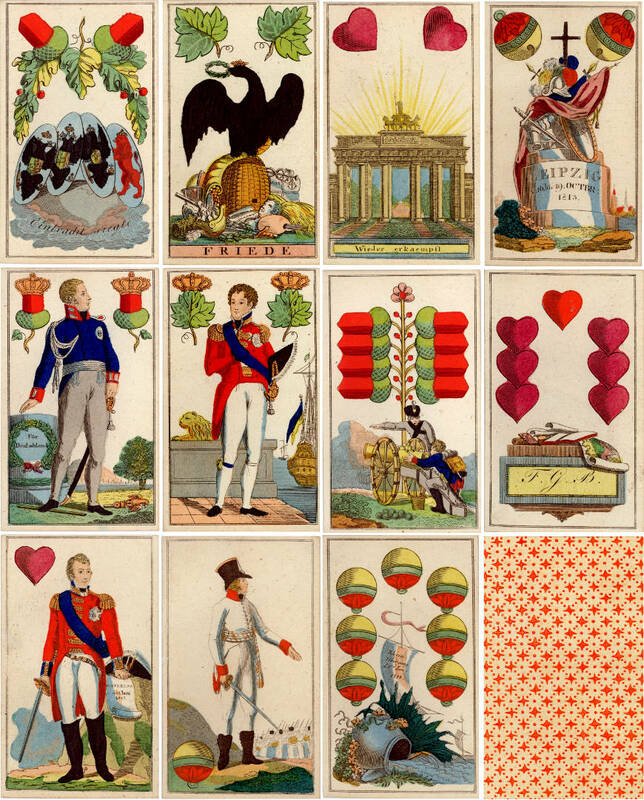 See also: Bergmannskarte, c.1816 Cartomancy Deck, c.1818 Anonymous Anti-Napoleon Deck, c.1815. Above: Victory deck commemorating the Liberation war by Friedrich Gotthelf Baumgärtner, Leipzig, 1815. From the collection of Klaus-Jürgen Schultz (http://spielkarten-sammlung.de).